In a talent scarcity situation, when the demand for talent exceeds the supply, you need to use an “attract the best” sourcing and recruiting process. This is represented by the left side of the supply vs. demand curve displayed in the graphic. Under these circumstances it’s important to recognize that the candidate initially has the upper hand. This will only change if the job being offered represents a true career move. Achieving this requires a much better job, a slower, high-touch recruiting process and a fully engaged hiring manager. While it takes more effort, when implemented properly this process won't only improve quality of hire but also reduce cost and time to fill. 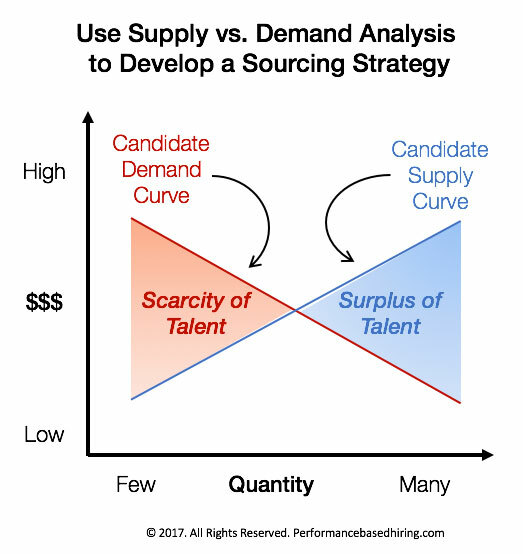 In a talent surplus situation when the supply of candidates exceeds the demand – the right side of the graphic – most companies use a “weed out the weak” process. This is a highly transactional process that involves box-checking skills, filtering candidates based on location and compensation and offering ill-defined lateral transfers. The goal is reducing cost per hire and time to fill by focusing on efficiency improvements. The use of artificial intelligence is very effective in this type of process, but improving quality of hire is problematic since the criteria for extending and accepting offers is unrelated to long-term career growth. It’s important to note that you can’t use a surplus of talent process based on weeding out the weak, when a surplus of talent doesn’t exist. In all cases when the demand for talent exceeds the supply you must use an “attract the best” process. Making this right to left shift is not easy, but essential if you want to improve quality of hire. Here’s how to get started. You’ll be able to remove the lid on quality of hire and attract more high potential and diverse candidates when jobs are defined as a series of performance objectives rather than a list of skills. For example, it’s better to say, “Design a chamber to test vehicle stress under high-speed turbulent air flow with limited direction” rather than, “Possess an advanced degree in mechanical engineering and be a self-starter.” As long as the person is competent and motivated to do this work, he/she will have the right mix of skills, experiences and competencies. You’ll never have money in your compensation budget to hire the best people in a talent scarcity situation. However, by offering candidates more career growth and more satisfying work, you’ll be able to minimize the need to offer excessive salary increases. I tell my candidates they should only accept offers that provide a minimum 30% non-monetary increase. This is the sum of a bigger job, more satisfying work, more impactful work and more rapid growth. 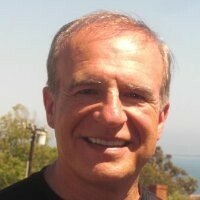 In these situations, the compensation needs are negotiable and rarely become the deal-breaker. More important, the candidate is assured of accepting the offer for the right reasons, balancing long-term growth with short-term needs. Traditional job postings are ineffective in a talent scarcity situation. However, career-oriented advertising that describes some of the big challenges and tells stories about why the job is important are invaluable for getting people to engage in preliminary career discussions. It’s unlikely your ideal candidates will find these postings, that’s why they need to be pushed to pre-select prospects as part of a multi-stage marketing campaign. You don’t need to be a Boolean expert to find exceptional talent. Instead, I suggest first developing a short list of pre-selected prospects who have achieved some type of formal recognition for exceptional work AND who would also see your job as a likely next step in their career progression. For example, for engineers I’d first find those with patents, some industry award and/or those who are members of an honor society. Then I’d narrow this list down to those who might see a move to a company that offered more growth and impact as a worthy career move. In addition, I would search on my connections’ connections using the same criteria and ask about the best of the people uncovered to get some great referrals. When the demand for candidates exceeds the supply, 80-90 percent of all sourcing and recruiting efforts need to be focused on the above activities. In the aggregate, this process does not take any more time since you’re spending more time with far fewer people. The payoff is an increase in quality of hire, more job satisfaction and reduced turnover. This is a relationship intensive process that requires better jobs, fully engaged hiring managers, exceptional recruiters and sourcers and a company more interested in raising quality of hire rather than reducing cost. You only need 10-15 people who meet this criteria to make one great hire. This is a lot better than reviewing hundreds of resumes and hoping to make one decent hire.